How did Donald Trump beat Hillary Clinton? What does it mean for our area? And what else happened Tuesday night? We conduct an election post-mortem with news columnist Jerry Large and assistant digital editor Gina Cole. BOOM. That was the sound of a political earthquake hitting the country when Donald Trump was elected president Tuesday night. 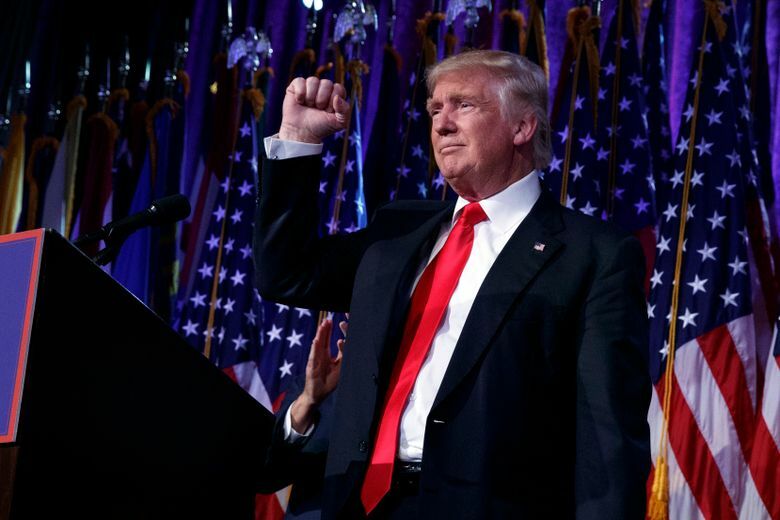 In Episode 10, we discuss Trump’s win and its potential aftershocks with Seattle Times news columnist Jerry Large and assistant digital editor Gina Cole. What happened in the presidential election? Why? Were Puget Sound voters stuck in a deep-blue bubble, unaware Trump actually had a chance? And what will the Trump presidency mean for Seattle, Washington state and the Pacific Northwest? We ponder those questions and others. At 5:30, Cole describes what Times reporters saw Tuesday night as voters reacted to Trump beating Democratic nominee Hillary Clinton. At 10:25, City Hall reporter Daniel Beekman explains why Mayor Ed Murray this week promised that Seattle would remain a so-called sanctuary city for immigrants despite Trump’s election, and why Murray is worried about the city’s federal funding. Though the Republican nominee made racist statements and relied largely on white voters, at 13:35 political reporter Jim Brunner says local Trump supporters are insisting the election wasn’t a victory for racism. “They just felt in the end like Donald Trump understood where they were coming from and that Seattle liberals and Hillary Clinton didn’t,” Brunner says. Trump’s defeat of Clinton overshadowed Tuesday night’s down-ballot results. But important choices were made on a ton of local races and initiatives. Washington voters passed a statewide minimum-wage hike. Puget Sound voters approved a mammoth transit measure that will add 37 new light-rail stations and cost $54 billion. Seventh Congressional District voters sent Bernie Sanders-endorsed Pramila Jayapal to Congress. And Seattle voters backed new rights and protections for hotel workers. Some liberals seized on those results as cause for hope, while others marched through Seattle to protest Trump. At 18:00, Cole wonders whether local lawmakers will be able to make progress on their priorities without support from the White House, and at 30:20, we acknowledge that many people in our area are very afraid about how Trump’s presidency could change their lives. Find and listen to past episodes of The Overcast here, and check out our other Seattle Times podcasts here.